December. While most of the world revs up into a frenzy of activity, preparing to celebrate I freeze like a deer in the headlights and feel overwhelmed. Presents bought – nope. Decorations up – thinking about it. Cards sent – not going to happen. 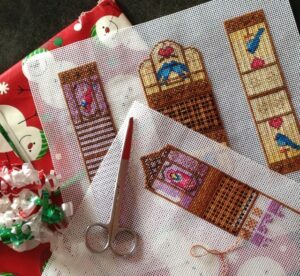 Stitching done – . . . you get the idea. I’ve still been stitching every day but only for a short while. My wrists threaten to play up if I stitch for more than an hour. So, progress has been very slow but I’ll show you what I’m working on. I think I mentioned a while back that I manage to lose my scissors fairly often so I felt the need for a scissor fob. I’ve been working on a set of three in the form of birdcages. While I’m not keen on the idea of caging birds I do love fancy cages. They would look silly empty so I’ve compromised. There are birds in the cages but the doors are all open. I’ll keep plodding along, stitching a little each day, and hopefully these will be released as patterns sometime – I’m going to be very vague here – next year. Wherever you are and whatever you celebrate around this time of year, I wish you peace joy and laughter and the company of those you love. This entry was posted in Uncategorized on December 21, 2015 by Elli Jenks.